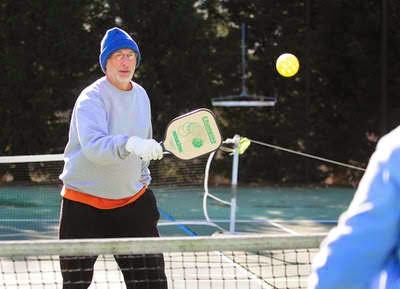 While interest in pickleball, a racket sport that combines elements of badminton, tennis and table tennis, is growing throughout Cherokee County, one couple is catering to the intermediate and advanced players. Tom and Ann Earley, who began playing pickleball while traveling to Arizona, fell in love with the game and brought it back to their home in the Macedonia community of Canton eight years ago. The Earleys had a pair of tennis courts on their property, but resurfaced them to create six pickleball courts in 2013. The courts are in use by regular players in the North Georgia Pickleball Club every Monday, Wednesday, Friday and Saturday morning.